I can't get enough of kale. It's cheaper than chips (pun intended), widely available and is packed with more nutrients than most vegetables or meat on this planet. I call it the superfood because it contains more iron than beef if we do a per calorie comparison, packed with anti-oxidants, helps prevent lung and cavity cancers as well as cardiovascular disease and rich in calcium. But wait, there's more, it contains omega 3 and has practically 0% fat. In the past, I've struggled to get Lil L's friends to eat vegetables when they come around on a play date. For most of the week, the main entrance of my flat is comparable to that of a revolving hotel door with kids coming or going all the time (no, I'm not running a nursery but Lil L has a busy social life). Most of them are incredibly fussy eaters with a hate list longer than my arm. I've refused to succumb to sausage and mash or spag bol (still getting used to that term), both of which I can only stomach a few times a year nor kill myself with exhaustion by cooking two separate dinners each night. I have found that if you encourage kids to experience and enjoy diverse cuisines, they'll naturally increase the repertoire of foods that they eat and develop a more mature palette. I've dealt with kids who declared that they'd never ever eat duck, mushrooms, Asian dishes or greens only to scoff them down by the spoonfuls. Kids are absolutely brutal and natural food critics. No holds barred. Some of the Michelin starred chefs (not naming names here but we know who they are) who can't deal with negative feedback probably have never cooked for kids on a daily basis. Kids just adore chips or crisps as they call them here. Well, so do I. Hence, the ever expanding girth. 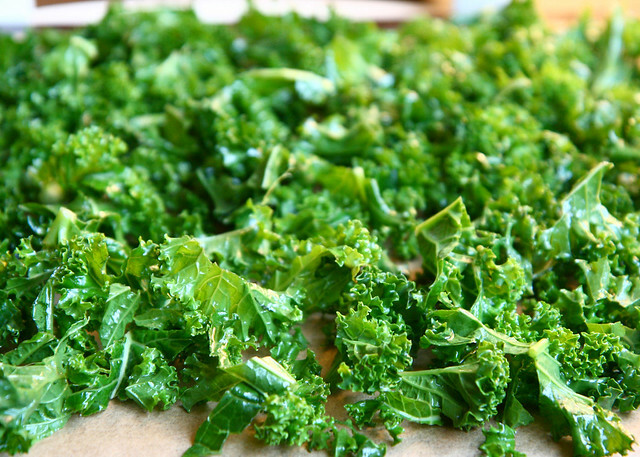 These kale chips taste divine and are far healthier option than potato crisps. You can also crumble and sprinkle them over donburi or rice like furikake. Remember to store the kale chips in airtight container. 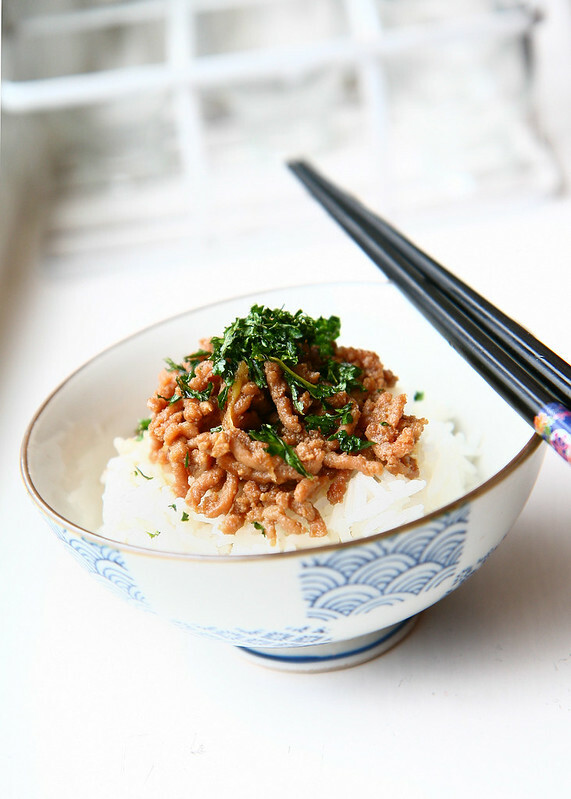 The minced chicken donburi can be prepared in less than 10 minutes. All in all, a healthy and nutritious meal in no time at all. I've only dared to put this on the blog after getting rave reviews over the past few weeks from kids who'd never eaten Japanese food before. 1. Preheat the oven at 140˚C. Put baking paper on the tray. 2. Wash and dry the kale. I normally put mine into a salad spinner but do it in batches. 3. 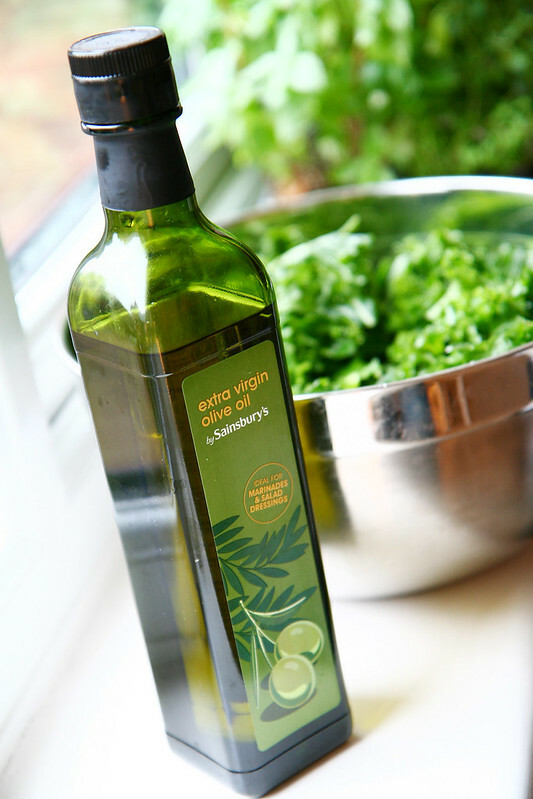 Toss the leaves in extra virgin oil. I don't add extra salt but just a tad is more than ample. so that the leaves can dehydrate but not burn. 1. Dump all the ingredients into a pan, wok or pot. Keep stirring until nearly all the liquid has evaporate which will take 5 to 10 minutes. 2. Serve with rice. You can add boiled eggs, spring onions or kale chips. I've never eaten Kale at all but this has inspired me! I think i'll have to adapt this one to my what i find in my supermarket. But i always like bringing in exotic recipes to meals routine ! This sounds delicious. I often crave a simple rice dish like this! Adding to the must-make list. That chicken donburi looks so tasty. I love Harumi's cook books. I often snack on kale chips now. I make them with grape seed oil for a bit of extra crunch. Yum! My entire household devours kale chips! All hail kale! Not thought of cooking kale this way but it's a new one for me. 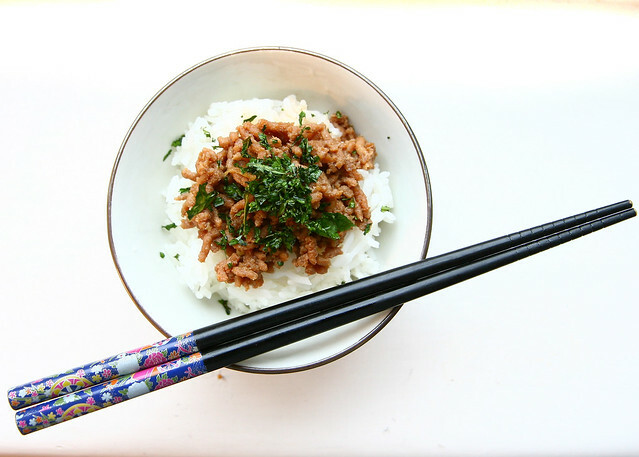 The chicken donburi is similar to something I do with turkey mince which I marinade with oyster sauce and fry in the wok. I give the boys some romaine lettuce leaves (shaped like boats) and they fill them up with mince and I give them a little bit of hoisin sauce and julienned cucumber) as well to garnish. Went down like a house on fire the first time I did it and it's become a regular now. I'm too scared to try on the boys' friends though. What a fab idea - I think I might try that with my two! Fun finger food! Kale chips - that is brilliant!!! 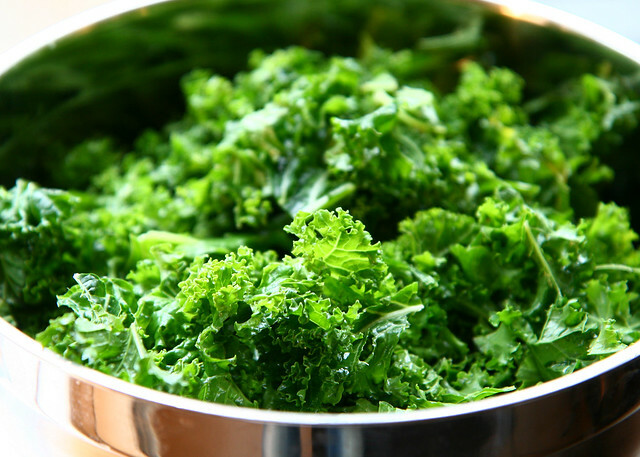 I love kale in general but it is not always easy to get the hub and my little one to eat it. I must so try this. I found Kale & Sausage Stuffing and forwarded to my MIL to try for Thanksgivibg, it turned out soo good. Your food looks so delicious, i want to lick a screen..ha. Oh yummy, I love Kale anyway it comes and it does so well with nuts fruit or any other kind of veg. My boys were good eaters when they were young and have become worse and worse - not sure why that happened. And my daughter is Queen of white food. You sounds like a lovely Mum hosting all those playdates! Yum!! This looks so good. I will definitely try it on one of those dull weekends. I've made kale chips before but made the mistake of putting too much sea salt. I will have to re-do and add them on this dish instead. Looks like the perfect topper! 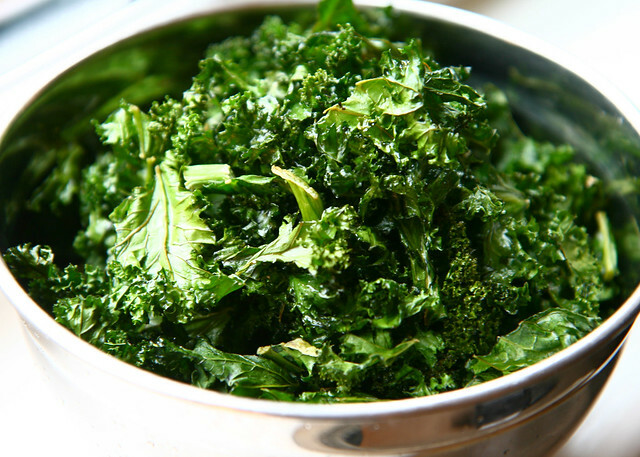 i love kale chips too but i buy them in a bag here ;) seems easy enough to make tho, might give it a go! mmmm yum yum. I have been using Kale in my smoothies but am yet to make chips. They sound so good. One day your daughter's friends are going to think back on that awesome mum who opened their palates to different foods and kick started a lifetime of food adventures! omg yum, and secondly your food pics are amaze lady! xO! I love Kale- I just have to go easy on it because I'm allergic to most of the cabbage family. Love it in salads and vegetarian sandwiches. Such a supper food. I have never tried kale before, am so intrigued and curious! Your food photos always look so bright and delicious. And I love all donburis! I swear by Harumi's Home Cooking cookbook for all my Japanese culinary experiments, it's really nice to see someone else making a lovely dish from that book! This looks sooooo yummy !! New post on my blog, hope you'll like it ! This looks really good, and I've been going through Kale Chips like no other from Whole Foods. Every time I pick up a bag, I always say to myself, "I should be making these."